Every child should have fascinating, Educational Toys like these. 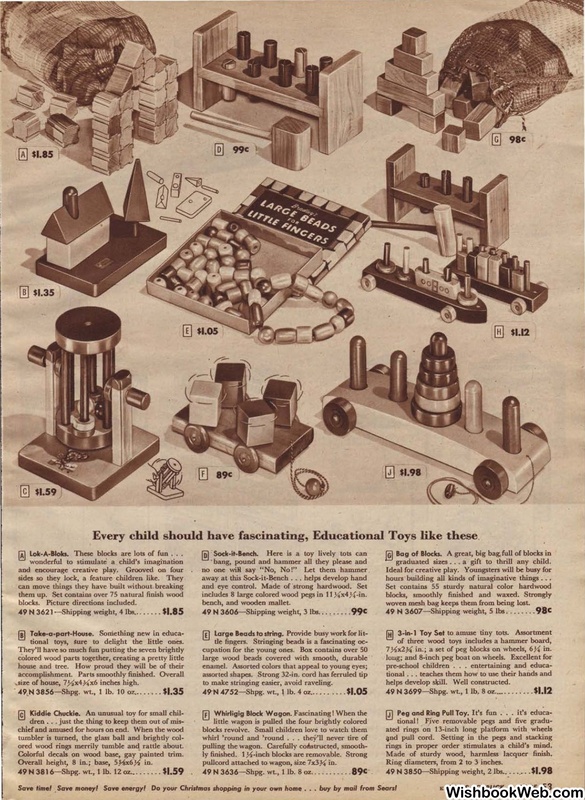 tional toys, sure to delight the little ones. ored wood rings merrily tumble and rattle about. Colorful decals. on wood base, gay painted trim. includes 8 large colored wood pegs in 11,Y4x47-1'-in. to make stringing easier, avoid raveling. graduated sizes ... a gift to thrill any child. woven mesh bag keeps them from being lost. in. ; a set of peg blocks on wheels, 67-1' in. helps develop skill. Well constructed. rings in proper order stimulates a child's mind. Made of sturdy wood, harmless lacquer finish. Ring diameters, from 2 to 3 inches.